It’s the time of year when we install new packages that either replace colonies that died over the winter or establish new colonies. Readers have asked for instructions for installing their new packages, so here goes…it’s going to be a long post, but worth it, I hope! Installing packages is actually one of the easier beekeeping tasks. In my opinion, there are only a few essentials. First, get good packages. Second, give the bees as good a start as you possibly can. Finally, kill as few of them as possible when installing the packages. If you can do this, you’ll be off to a good start! The best packages are ones that are delivered directly from the source. If possible, purchase your bees from someone who drives down south to pick up the packages and then returns with them as quickly as possible. Packages that are delivered quickly suffer little, if any, losses, while packages delivered through the mail system can have losses as high as twenty-five percent. 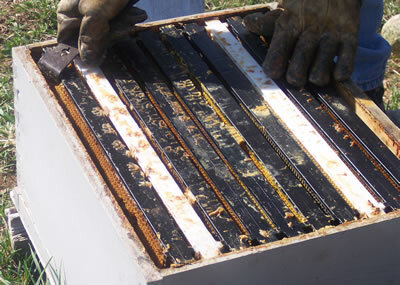 When you have your packages, make sure that the hives you will be putting them into are clean. Remove all blackened comb and dead bees if you are using an old hive. 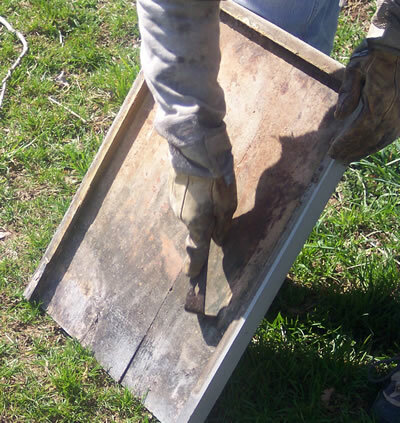 Scrape the bottom board. 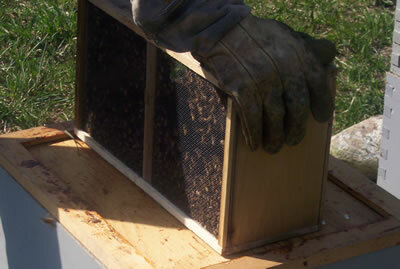 If possible, use a frame or two of honey and pollen from an existing hive to help the package get a good start. 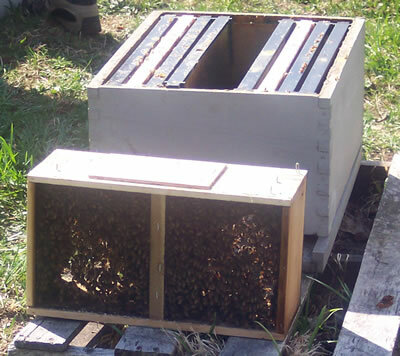 Start the package in a single deep and be sure to reduce the entrance until the package is established if there are existing hives in the area. If you do not do this robbing will be a problem. Fill an entrance feeder before you get started and keep feeding them as much as they will eat until the spring nectar flow begins. 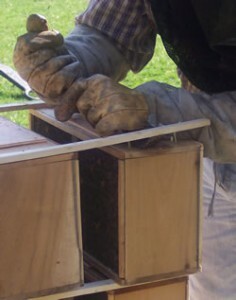 If you have more than one package, separate them by prying off the connecting pieces of wood with your hive tool. 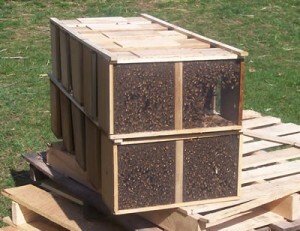 Place each package next to the hive in which it will be installed. Make sure the hive is completely ready, but remove the two center frames. Move the remaining frames outward as far as possible to give yourself plenty of space in which to work. 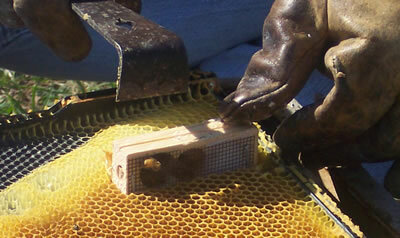 Using your hive tool (is there anything that tool can’t do? ), pry off the small sheet of plywood that covers the top of the package. Keep it handy, since you will need it. At this point, the bees still cannot leave the cage. 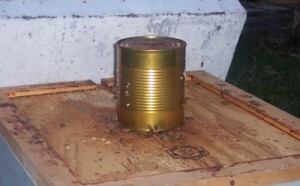 Beneath the cover is a can filled with syrup as well as a small metal disc that is connected to the queen cage. Gently lift the metal disc and remove the queen cage. As soon as it is out, the bees will be able to leave the package. To prevent this, place the plywood cover over the opening while you are working with the queen cage. Pry off the metal disc and discard. Check the queen cage. Make sure the queen is alive. If she is dead, install your package without her and then contact your supplier as soon as possible to get a replacement. They should be able to ship you a new queen quickly. (I have never had a dead queen, but it never hurts to check.) 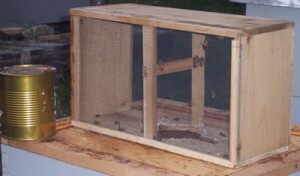 The queen cage has two small holes on either end. One hole is plugged by white candy, which can be seen in the photos above. The other end is plugged by a piece of cork. Some suppliers place a piece of cork in the side that has the candy. 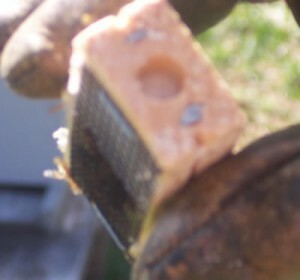 If this is the case, remove the cork so the bees can begin eating the candy, thus allowing the queen to leave her cage. Do not remove the cork on the other side. Next, take a good frame that has been drawn out. 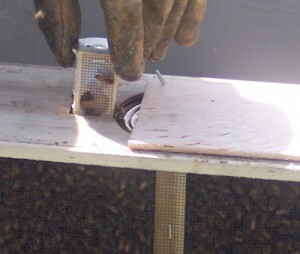 Gently push the queen cage into the frame so that the candy side will be on top when the frame is placed in the hive. This prevents the opening from becoming blocked if any of the queen’s attendants die before the candy has been eaten away. This way, if they do die, they fall to the bottom of the queen cage and the queen can still exit through the hole, which is pointing upward. Make sure that the cage will not be directly beneath the hole in the inner cover. Replace the frames. Do not leave too large a space between them. If you do, the bees will build comb that you will just have to remove later. The next step is probably the hardest of all, since it has to happen fairly quickly in order to kill as few bees as possible. You will be finished in about ten seconds if it is done well. First, pick up the package and GENTLY tap it on the ground. This will cause the bees to fall off of the top of the package. The purpose of this is not to “stun” the bees, as many people suggest. Instead, all you are trying to do is to make as many of them as possible lose their grip on the package. Next, using your finger and the hive tool, pry up the can of syrup and remove it. Now there is a large hole in the top of the package. Cover it with the small piece of plywood. If it takes too long to remove the can, you may need to tap the package on the ground one more time. Remember: GENTLY! 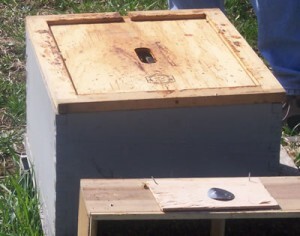 With the bees on the bottom of the package, remove the plywood cover and turn the package over so it is directly above the hole in the inner cover. If you do this quickly, virtually no bees will be killed. If a few are caught between the package and the inner cover, do not try to save them. You’re almost done! 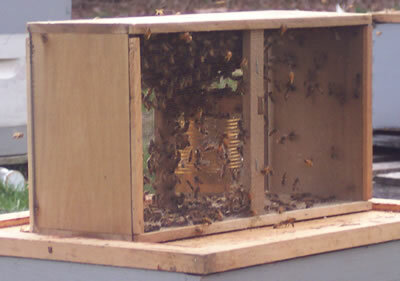 The bees will immediately smell the queen inside the hive. 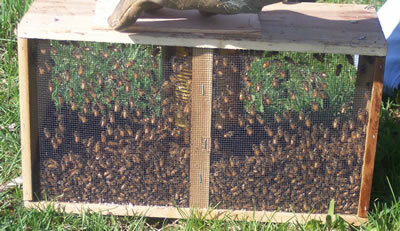 Since they want to be near her, they will move through the hole down into the hive on their own. In just a few minutes, the package will be nearly empty. Don’t worry if there are a few stragglers. They will find their way down eventually. By dusk, virtually all of the bees should be in the hive. There may be one or two left, but don’t worry about them. There will likely be a dozen or so dead bees also. Again, you do not have to worry about them at all. When the bees have left the package, remove it and discard. Place the feeder can over the hole in the inner cover so the bees can finish off the syrup. Make sure that the holes in the can are pointing downward! If you have an extra empty super, place it on the inner cover and then put the outer cover over it. 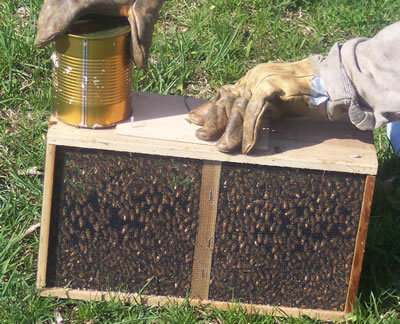 If you don’t have a spare and the weather is not too cold, you can leave the hive as it is until the can is empty. In two or three days, check the hive to make sure the queen has been released. It is very uncommon to find her still in the package, but if you do, remove the cork from the other side of the queen cage and put her in the hive. When she is released, remove the queen cage and discard. You’re done! Remember to keep the feeder jar full until the nectar flow begins and keep the opening reduced for a while to minimize robbing. In a week or so, check for eggs and larvae. A few people have contacted me asking if I have any packages left. I don’t, but if you’d like to be added to the mailing list for next year, let me know.